Dutch Plantin recently developed a new type of growbag, called the Optima. This growbag contains a special mix of both coco pith and coco chips. A mix that offers more stability when it comes to the structure of the growbag. That way, the substrate maintains a higher air content during the years of reuse. We are currently running tests with strawberries, which show a perfect rooting. 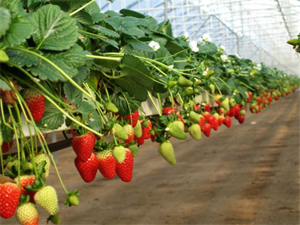 We have fifteen years of experience in producing special coir as a loose substrate to grow strawberries, which we now used to develop a compressed growbag, that also holds chips. For many years, growbags with a filling of 100% loose coco pith were considered the standard. Growers used the same growbags for three or sometimes even four years. During that period of time they noticed a reduction of the air percentage every year. That meant that they had to drip the growbag very carefully to protect the substrate from getting too wet. Nowadays growers tend to use the same bags for mostly two, but three years tops. But our new Optima growbag enables them to use the substrate for at least three years. And it’s likely that the bags will last even longer. The use of the Optima therefore can lead to a significant reduction of the costs per year. Dutch Plantin produces the Optima growbags buffered or washed, depending on the growers’ demands. When they choose to order their growbags washed, we support growers to buffer and wash their growbags themselves. That way, they save money without risking the quality of the crop. Dutch Plantin has great experience in the treatment of coir, and we are happy to share our knowledge with our customers.